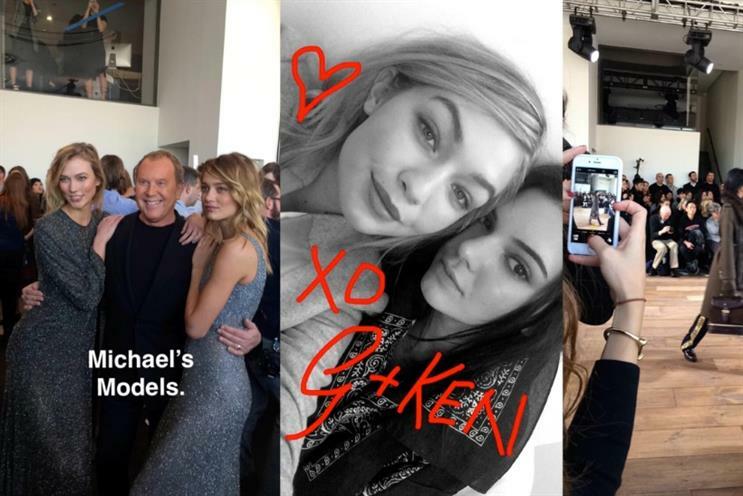 Michael Kors partnered with Snapchat for New York Fashion Week, giving younger fans access to behind-the-scenes moments at shows. The luxury brand offered exclusive content, including snaps of the designers and "candid" front-row shots. In typical Snapchat style, Michael Kors content on the 'Our Stories' feature was only live for 24 hours. This latest partnership features Michael Kors bumping up its digital presence, with content across Facebook, Instagram, WeChat, Twitter and Pinterest. Given Snapchat's usually youthful demographic, the presence of a pricey luxury brand may seem a little strange. But fashionistas following New York Fashion Week are increasingly using the app to cover the event, according to Bloomberg. Fashion editors and attendees are using the app to cover the shows in a new, more immediate way. This gives brands the chance to reach a highly engaged audience, while also presenting their story in a more controlled way. Lisa Pomerantz, senior vice-president of marketing at Michael Kors, said: "We’re always looking to tell our brand story on the platforms our fans are using and loving. "Snapchat provided a unique opportunity to take our 'All Access Kors' strategy a step further – allowing us to share intimate, behind-the-scenes moments from our runway show with fans around the world."